Sandstone is a natural stone that is made up of sediments gathered from the sea and the land. Sandstone has been used in the building industry for more than a century and has a variety of uses, including driveways, walkways, patios and fire pits. 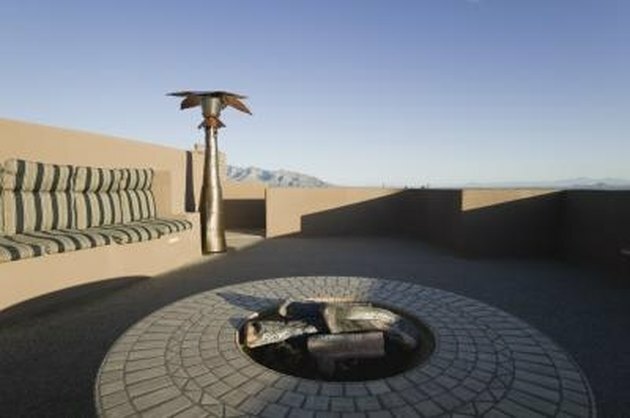 Sandstone is an excellent choice for fire pits because of its natural beauty and durability. Building your own sandstone fire pit can not only provide a lovely addition to your yard, it can also save you money compared to the cost of hiring a contractor. A fire pit can provide an attractive addition to your yard. Dry-lay your sandstones. Position the sandstones as you want them to look for the final fire pit. Use the chisel and brick hammer to score and split the stones so they rest flush against each other in the desired shape of your fire pit. Ensure all the joints are tight and your stones are where you want them before proceeding. Mark the ground about an inch outside the perimeter of the sandstones with a shovel or spade. Remove the stones and create a trench that is 12 inches deep and as wide as one block around the perimeter area you marked off. Then dig down 6 inches in the area within the trench. Lay the sandstones in the trench to ensure they fit. If not, widen the trench. Fill the trench only with a 3-inch layer of gravel. Compact the gravel with hand tamper or plate compactor. Add a second 3-inch layer and compact this layer as well. Lay the outer ring of sandstones in the trench. Set a level on top of every two stones you lay to ensure the surface is level. Work along the perimeter until you have laid the entire outer ring. Wipe the top of the sandstones you just laid so they are free of debris. Add a zigzagging layer of masonry caulk atop the sandstones and set a second ring on top of the adhesive. Center each stone for the second ring over the joint between the two bottom stones. Fill the pit with 6 inches of gravel. Add a third and fourth ring of sandstones by repeating the steps of adding a layer of masonry adhesive and setting the stones on top. Add an iron campfire ring into the circle. Scott Christ has been writing professionally since 2003. He works as a writer for a health-care communications company in Michigan. He also runs a freelance copywriting business that specializes in marketing and communications materials for the health-care industry. He holds a Bachelor of Arts in business administration from Michigan State University.